TNUSRB SI Application Form 2019 – Tamil Nadu Uniformed Services Recruitment Board (TNUSRB) has released the TNUSRB SI Application Form on March 20, 2018. The form has been made available on the official website i.e. tnusrbonline.org. Up to April 19, 2019 candidates can do the registration for TNUSRB SI 2019. The application form has been released for the post of Sub Inspector (TK, AR, TSP). Candidates can only use mode for filling up the TNUSRB SI Application Form 2019. The application fee is Rs 500/- but if the candidates apply for both i.e. for open quota and departmental quota then candidates have to Rs 1000/- as a fee charge. From this page, candidates will get full information regarding the TNUSRB SI Application Form 2019. Latest: TNUSRB SI Application Form has been released, Scroll down to access the link. In the form candidates should valid details. The candidates who will fill the form on time those application form will be taken into consideration for the further recruitment process. For more information regarding TNUSRB SI Application Form 2019 check the schedule given below. Apply Online: Click Here to register for TNUSRB SI Recruitment 2019. The candidates have to pay Rs 500/- as an application fee without paying the fee the registration process will be completed. The candidates applying for open quota and departmental quota then those need to pay Rs 1000/- as the fee charge. Mode Of Payment: The candidates can make the payment by using online and offline mode. The candidates who want to make online payment can do it through net banking, credit card, debit card etc. The candidates who have opted offline payment mode can make the payment by depositing the cash through SBI E- Challan at Stae bank of India (SBI). 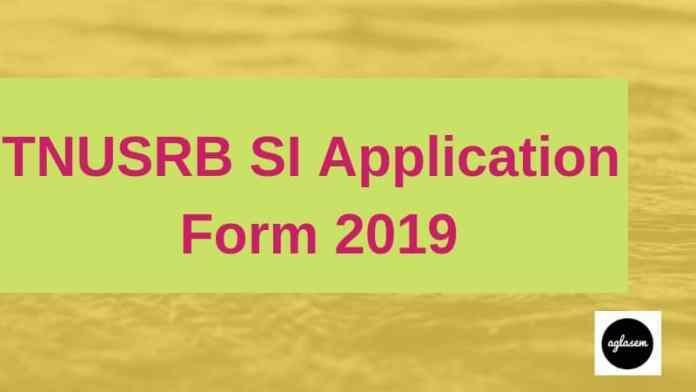 How To Fill TNUSRB SI Application Form 2019? Candidates can follow the steps given below for filling the TNUSRB SI Application Form 2019. After filling form candidates should take the print out of it for future reference. Thereafter, click on the application form tab. Thereafter, the login page will appear. If you are a new user then click on the Create New User link. On clicking the Create New User link, New User Sign Up Form page will open. In that page fill e-mail id. After filling the id click on the send OTP option. (After clicking on that option OTP will be sent to the mentioned email id). Thereafter, application form sign up 2nd page will open on that candidates have to fill mail id, name, password etc. After filling that click on the submit button. Thereafter, the Application Form filling page will open in that fill personal details, contact details, educational detail, qualification detail and have to upload passport size photograph and signature. Thereafter payment page will open. On the payment page, candidates have to select the medium through which you want to make payment and have to provide other details. After proving all the details click on the submit button. On clicking on final submit button. Note: On successful registration confirmation page will open, candidates, should take the print out of that. While filling the application form candidates should first collect the documents which will be needed because this helps the candidates in easily fill up the form. From below candidates can check the documents which will be needed while filling the form. Till now the application fee has not been revealed by the board. As any information regarding the fee will be revealed it will be updated here on the page. Without paying the fee registration process will be not considered as completed. Mode of Payment: Candidates will be able to make the payment by using two-mode i.e. online or offline. Online Mode: The candidates who want to make online payment can so it so by using the Credit card, debit card, internet banking etc. 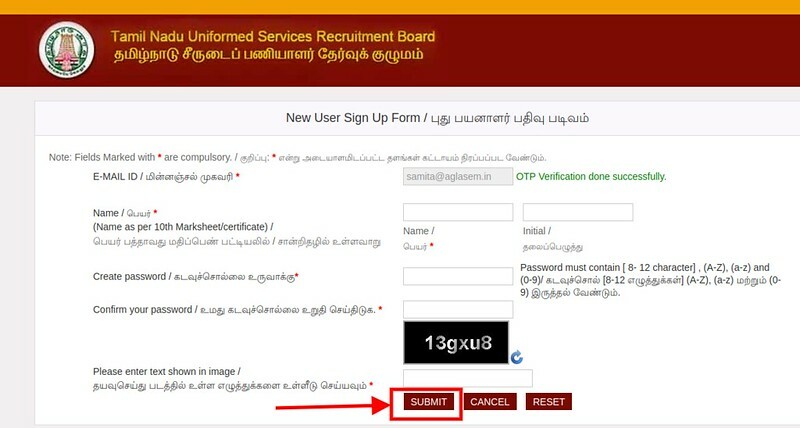 Tamil Nadu Uniformed Services Recruitment Board (TNUSRB) released the short notification regarding the TNUSRB SI 2019 Recruitment on March 08, 2019. The recruitment will be done for 3 posts namely; Sub-Inspector of Police (TK), Sub-Inspector of Police (AR), Sub-Inspector of Police (TSP). Post wise vacancy distribution has been done. There are total 969 vacancies for the post of SI. In TNUSRB SI Recruitment 2019 will be done on the basis of written examination, Physical Measurement Test (PMT) / Endurance Test (ET) / Physical Efficiency Test (PET), Viva Voce, Special Marks, Medical Examination and Documentation.